As we prepare for the 2016 summer season, we have seen the arrival of our new sandstone spheres. 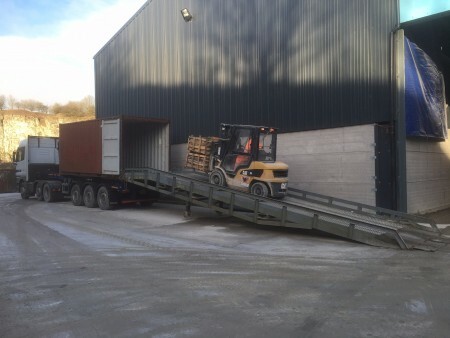 Today we unloaded our second container of the beautiful stone balls. Each created individually from solid blocks of sandstone. Stocking two colours including Rainbow sphere’s and Golden sandstone sphere’s also known as teak sandstone. 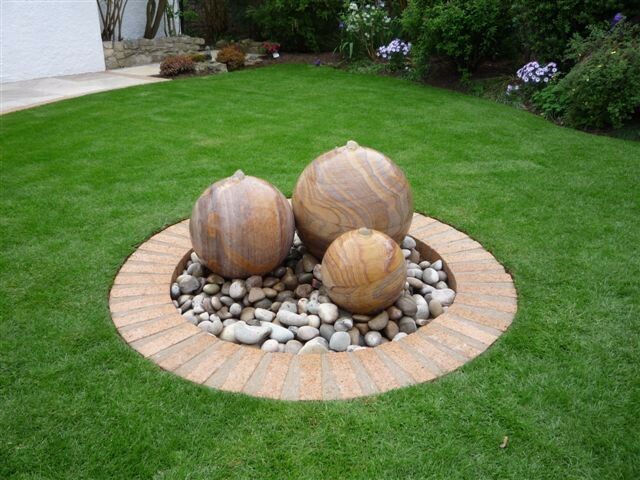 The stone garden spheres, look fantastic as they are for garden feature pieces, but we also have the facilities on site to drill the sandstone balls, making them into fantastic water features. We are also able to offer our infinity drilled spheres which involve us drilling a 250mm hole through the top of the sphere and removing the core. This creates the effect of an infinity pool at the top of the sphere. Here’s a little example of some of our recent bespoke work! Its not all about whats in our online shop! 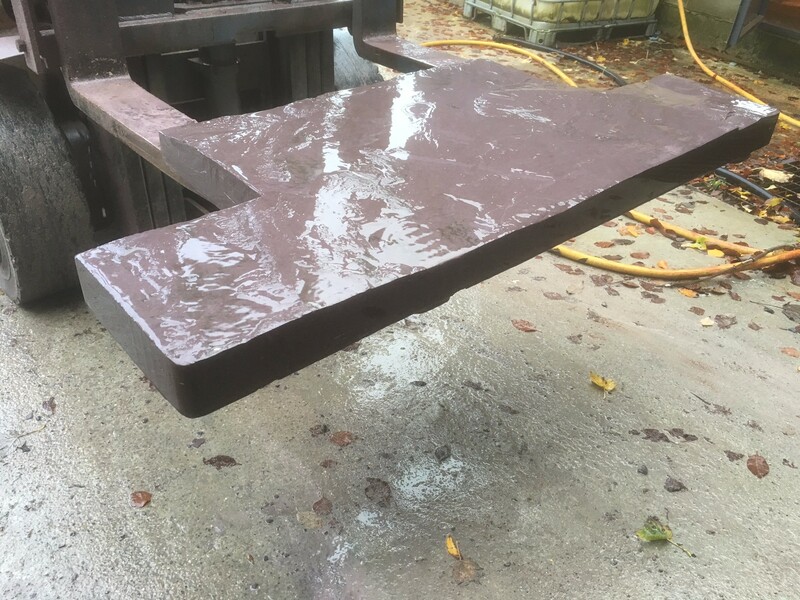 This slate hearth stone was created by us last month from a large block of slate we had at the request of a customer who wanted something a little extraordinary. Splitting the slate to give a beautifully riven top and then cutting, rounding and polishing the edges resulting in a completely unique welsh slate hearth for our customer. If you are interested in having something a little bit different in your home, then please get in touch, we love working on special projects and bringing ideas to life! New Sandstone Spheres available for pre-order! We are pleased to announce our first new products due for 2016 are sandstone spheres. These stunning solid stone spheres make fantastic decoration for any garden project. Created from beds of sandstone where the mineral and metal content has made beautiful veins of colour. The rainbow sandstone spheres are particularity vibrant in colour ranging from yellows through to purple, with each stone sphere being completely unique from the next. 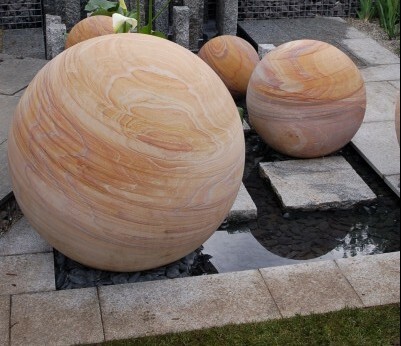 Our sandstone spheres can now be found on our online shop and also have the option of being drilled to transform them into stunning stone sphere water features. as with all our stone water features, customers receive 25% off our water feature reservoirs and pumps to go with the items. Our first stock is due in Mid January and we are now taking pre orders for the 300mm, 400mm and 500mm sandstone spheres in Rainbow and golden buff colours. Our help section is now completed for our rockery stone. 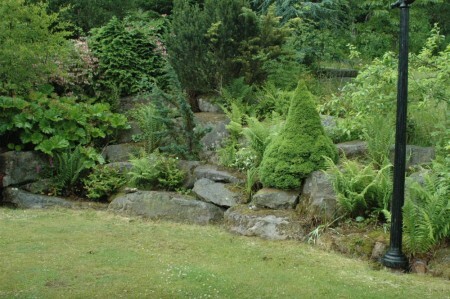 We have been sourcing and helping clients with rockery stone for many years. Its one of our specialties and we now have our advice pages online to help pass on a little of what we have learned! Our new Romance monoliths are a product we have wanted to create for a long time, although we had been able to process the cut for a long time we weren’t able to polish out the saw marks to what we considered a high enough standard. This week we acquired the tooling to make it possible. So our exclusive romance monoliths will be available as stand alone pieces and as water features very soon. They require a lot of work and its a product we’ve been wanting to get exactly right before putting it in our shop. Although they will be listed there each one will be made to order, we will also be able to engrave the inside of the heart and add other features at your request. Its a little later than scheduled but the last few weeks marked the final stages of our concreting and yard preparation. 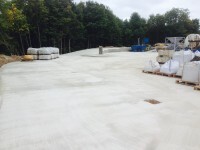 Laying over a thousand tonnes of concrete in six months, we are now ready to start focusing more on our new products. We’ve still got a lot to do to get it just how we want, but were getting closer. As you can see the beautiful large limestone monolith is used to create an end to our curved entrance wall which is yet to be built. 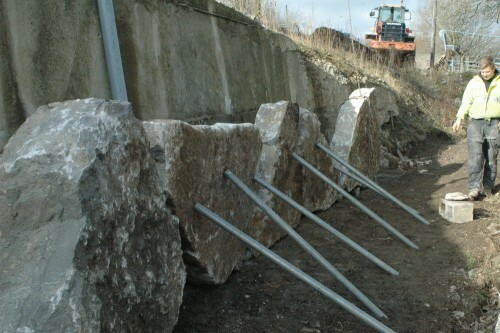 We will be using our new cropped limestone to construct the wall. We also plan to build a large display area where we can run water through our monoliths to show our customers the different effects that can be achieved with pressure variation in stone monoliths. New products for the summer! We’ve got lots planned for 2015! its going to be an exciting year! New water features and our own specially designed reservoir systems are just some of the items we will be launching in the next month. 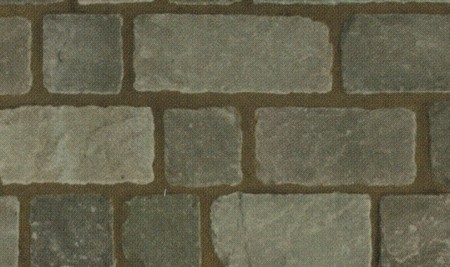 For now we are frantically working trying to bring a whole new range of unique stone setts and natural stone paving to the market. Including our stunning Graphite Grey Setts, which are produced in three different sizes and varying shades of grey which create an brilliantly elegant look. 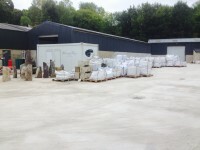 Getting our new yard and workshop ready! Its been a tiresome journey! 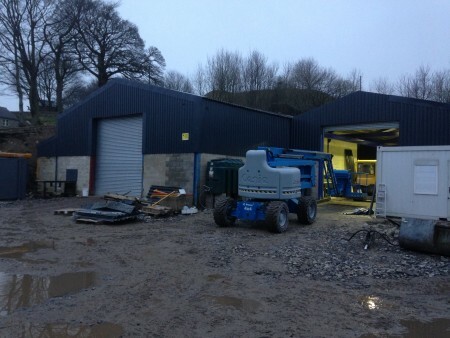 Starting in the summer of 2014 we have been working hard to get our new premises underway. A little behind schedule, but we are nearly ready to move in! New overhead cranes and drilling facilities are being arranged and better cutting and stone engraving machines on order. 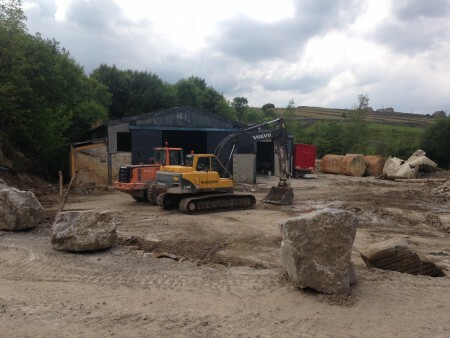 This picture shows a view of the yard from The summer of 2014, we will keep you updated on progress and our plans for creating more products as our workshop gets fitted out! Wadsworth Design prepares for 2015! 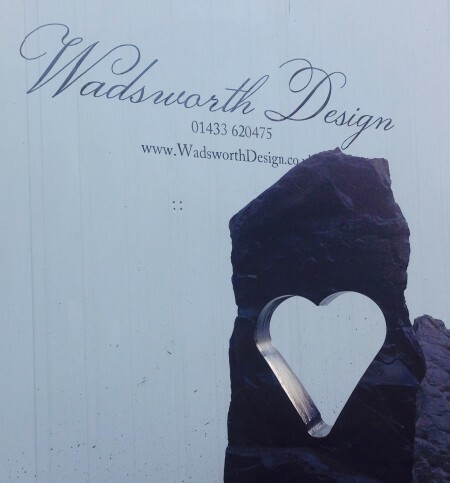 Wadsworth design has been working hard on preparing its new premises and website for 2015, Our new premises promises to bring us manufacturing some great new products for the summer, We have been investing in new state of the art diamond drilling and sawing facilities for the production of our natural stone water features. We have many new product ideas in the pipeline and will keep you informed of our new releases!